"An authentic rural Mexican dish usually prepared with pork, posole is traditionally eaten at New Year's. This version is a great way to unload those turkey leftovers! Garnish with crisp tortilla chips, shredded green cabbage, and a squeeze of lime." In a large Dutch oven, heat oil over medium heat. Cook onions and poblano chiles in oil until soft. Stir in garlic, and cook for one or two minutes. Season with chile powder, cumin, and oregano. 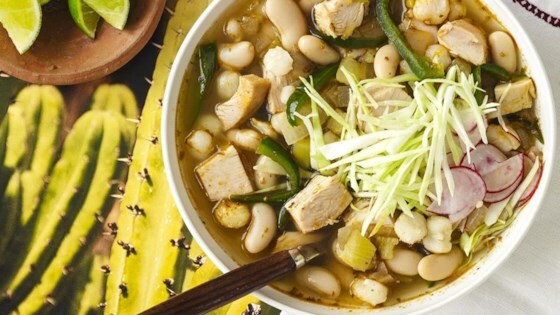 Stir in turkey broth, cooked turkey, canned green chile peppers, cannellini beans, and hominy. Stir in water if more liquid is needed to just cover everything in the pot. Season to taste with salt and pepper. Bring to a boil, then reduce heat to low, and cover. Simmer, stirring occasionally, for about an hour to blend flavors. Great soup! Pretty much followed the recipe and it was delicious. Obviously it's not a traditional pozole, but hey it tastes really good, isn't that what matters! Even as a picky eater, my husband finds this quite delicious. Easy to make, tastes great and authentic (to what I've had living with a family in Cuernavaca, Mexico) even using turkey.